Looky here, I took my casual style up a notch. I must say, it felt good to put on a dress, wear bright colors and feel a little more feminine compared to the last few days. We received much needed rain earlier in the week. Then the sun came back out and spring sprung again, for the third time. I couldn't resist slipping my arms into this floral blazer again and adding a ladylike touch. The last time I wore it was for comfort and a streamlined style. I always feel guilty when I post pieces that are no longer available, so today I created two styles inspired by what I wore; items you can shop for now. I didn't include detailed accessories, just four basic pieces in each round up. I figured it would give you ladies added inspiration. 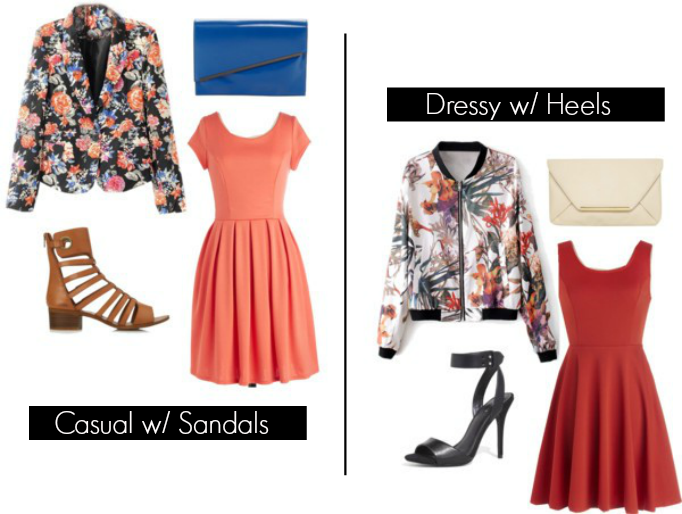 This look is so easy to recreate whether you a wearing a floral blazer or another print. Taking a basic dress and adding a light weight, patterned jacket, bold bag and strappy sandals, ensures a sweet and sassy outfit for spring. Happy weekend and happy shopping! The title of this post is perfect for this outfit. I literally love everything about it! You'll be sunny wherever you go in this! Love this colorful outfit, you look so pretty. Love your outfit! And shoes! I wish I could pull off bright colors like that. ;) Lookin' good! I want the exact dress you have on! It fits you so cute! I am loving all of the bright colors in this look! It just makes me happy!! 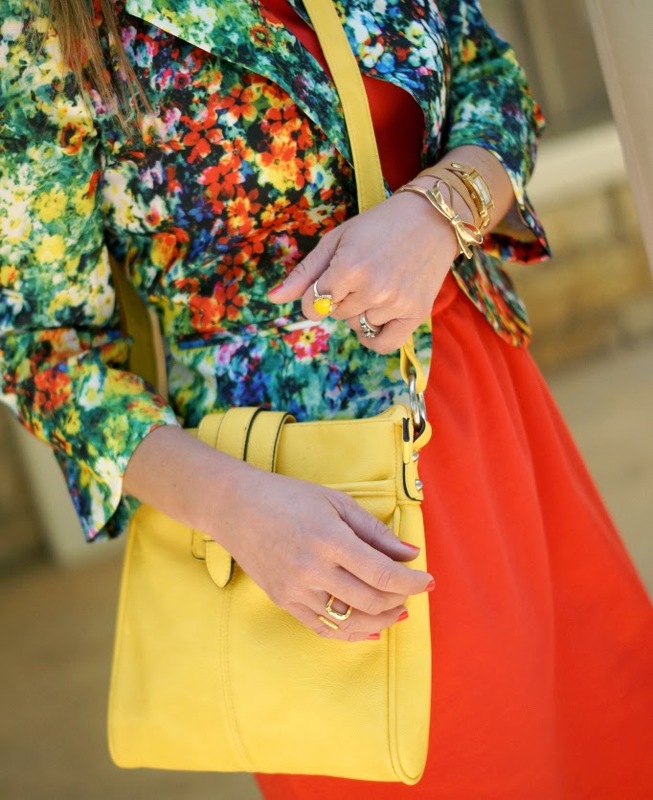 This outfit just screams spring with the florals and the bright colors! Have a great weekend, Shanna! this makes me want to go to francescas!!! i love how colorful you look! Colors are my jam. Great outfits! This is so pretty!! I love the bright colors and your sandals. I loooove all the colors in this outfit, Shanna! So pretty!! Love these sandals! You find THE best stuff at F21! Can I come shopping with you?? I love how throwing on pretty bright clothes can make a world of a difference in how you feel. Although, I really loved all your casual looks too :) You totally just gave me an outfit idea! Thanks for the inspiration! So adorable! Love the bright dress and floral blazer. Have a wonderful weekend! That blazer is perfection on you! Love it! So pretty and vibrant! Those sandals are super cute with all of the straps. Hope you are having a great weekend! love the bright colors in this look! Fun, bright & girlie grounded by the most perfect neutral heels! Nailed it again pretty lady! I love the bright colors! I want that bag!